John R. Brooke (1828-1926), Brigadier General, USA (PA). Sharpsburg, Fredericksburg, Chancellorsville, Gettysburg (WIA), Wilderness, Cold Harbor (WIA). Next to last surviving Union general. 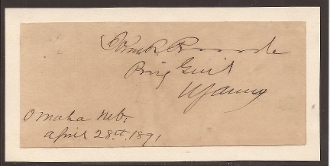 Clip autograph with rank as Brig. Genl., U.S. Army, Omaha, Nebraska, April 28th, 1891.